"The home of Surrey bowls"
. 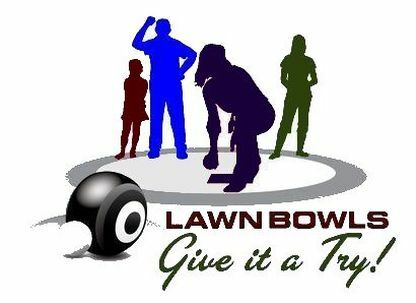 Come and try bowls for free!! 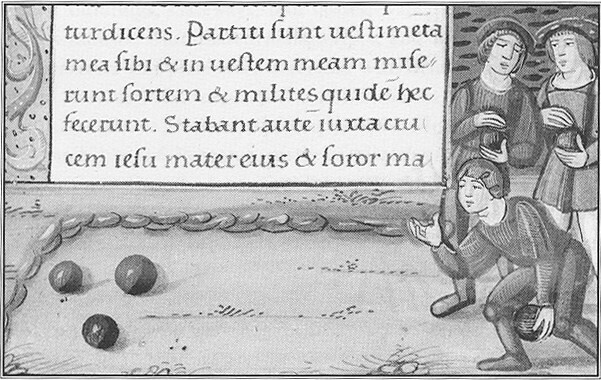 Played since medieval times, bowls is now enjoyed by over one million people worldwide. Click here to discover why this wonderful game has such lasting appeal. 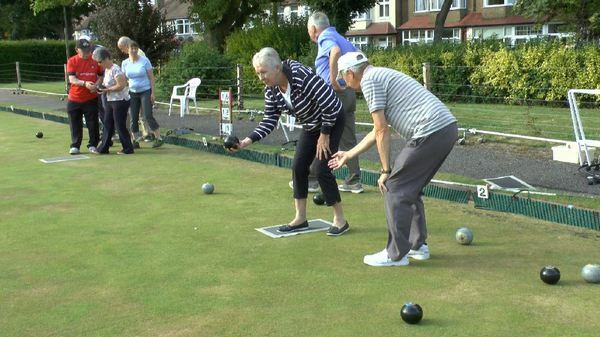 Cuddington Bowling Club's founders, in the form of Cuddington and Stoneleigh & Auriol Residents’ Associations, along with the Mayor of Epsom, were invited to experience a taste of the game during our 80th anniversary celebrations in 2016. Members turn out for the first day of the season April 20th 2019. Our new defibrillator is displayed in the foreground. The companies whose sponsorship made its purchase possible are featured on the advertising banners displayed on our pushers. We are a very friendly and inclusive club and do our best to support one another. 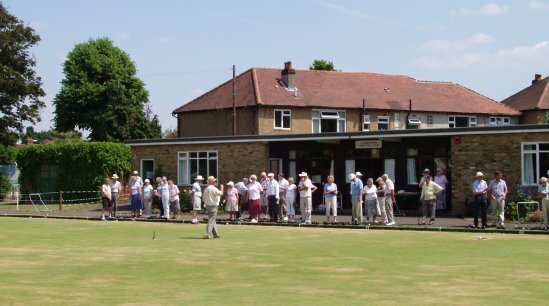 The men's section of Cuddington Bowling Club was formed in 1936, and the ladies section in 1952. The two sections are now fully integrated but still retain their respective identities, with dedicated fixtures and competitions. The bowling green has gained a reputation for being a great playing surface. Come along and try a great game, get free tuition and make lots of new friends. The bowling green sits on the edge of Cuddington Recreation Ground. It is overlooked by a pleasingly manicured and tree populated upland hill. Our latest piece of equipment could literally be a life-saver! Thanks to local business sponsorship, the club has been able to purchase an AED (Automated External Defibrillator). Here members are shown receiving training in how to use it, and practising CPR on helpless dummies, on the opening morning of the new season (20th April 2019). TUESDAY EVENINGS WILL NEVER BE THE SAME AGAIN! LOOKING TO IMPROVE YOUR GAME? - Come along to our regular coaching sessions. JUST WANT A BIT OF FUN? - Nick Tidman will be organising informal roll-ups, such as short mat, singles, pairs, triples, or anything that takes your fancy on the day. SUPPORT THE RED & GREEN STICKERS! Why not come along and watch a game of bowls whilst having a cup of tea. 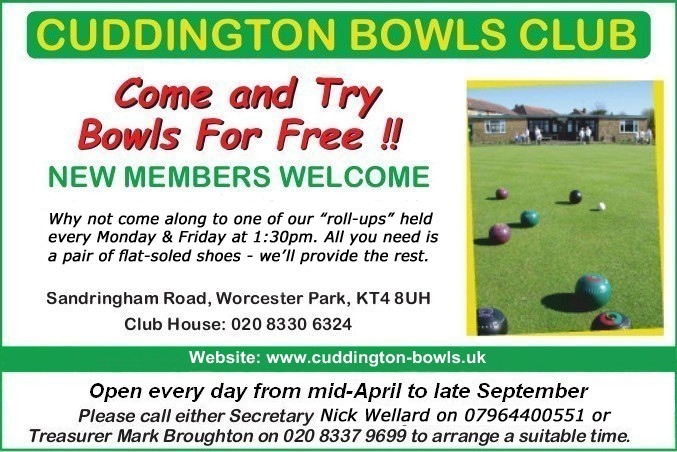 At Cuddington Bowling Club we will make you very welcome and will answer any questions you have about the sport. There is no better way to spend an afternoon than to relax and enjoy the sunshine whilst watching us play a home game in one of our friendly matches, or not so friendly league fixtures. Visitors are most welcome. Anyone wishing to arrange a game at any time should contact our Match Secretary Nick Tidman, tel: 020 8643 8889. 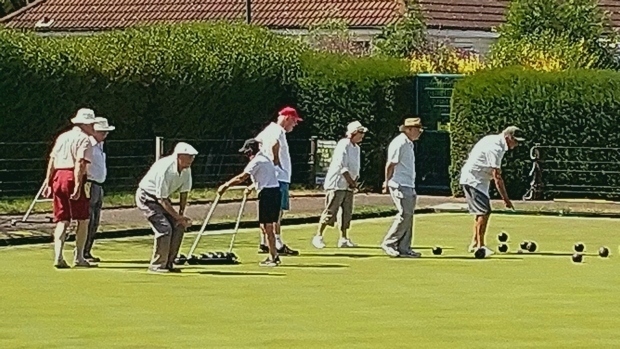 Cuddington Bowling Green is a public facility and members of the public wishing to play bowls on a temporary basis should apply to the club pavilion when play is in progress. Green fees are £2.60 per player per hour, free for children if accompanied by an adult. The Green is available for play from 11:00am until approximately 8:00pm or dusk, from the 4th Saturday in April until the last weekend in September. The Cuddington team give a thumbs-up for reaching the finals of the PAST TIMES COMPETITION 2016 against Old Coulsdon B.C. Left to Right; Mark Broughton, Archie Flashman, Graham Green, Colin Gurney, Dave Cabot, Brian Crowe, Alan Harding & Norman Bull. Neither Cuddington or Old Coulsdon have had the distinction of reaching the finals before and it was Old Coulsdon who triumphed in the end. Although it's congratulations to our rivals for a well deserved win, we on the other hand can console ourselves for a good run through the rounds. AKA "The Man from Del Monte"
"I was having trouble walking, so I went to the doctor the other day. He said to me 'What would you say if I told you your leg may be broken in two places?'. I said 'Well, I wouldn't go to those places!'" 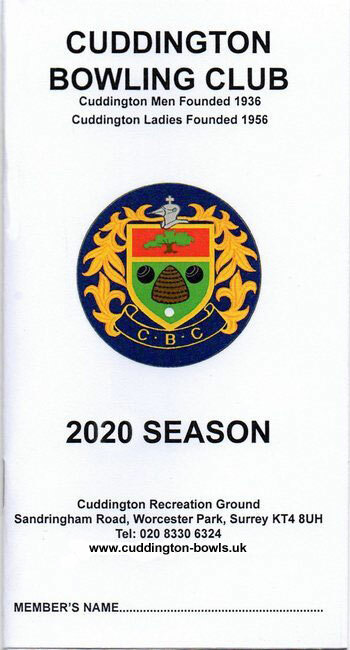 The Club is affiliated to Bowls England, Surrey County (Area 2, Division 4), Surrey County Womens Bowling Association (Zone 3), and to the Sutton & District Bowling Association. We have regular matches both home and away throughout the year. Social events are held regularly, and are open to members and their guests - see the Social page for more details. Our annual Presentation Evening & Dinner held on 24 October 2018 - see the Gallery page for more photos.